In Free Macrame Patterns you will learn the ancient craft of using beautiful decorative knots to make artistic designs. Macrame has been around for over 1000 years, and it is once again increasing in popularity. We've developed this site to help re-introduce this unique craft. Here you will find over 300 pages of instructions and photos to help you create a variety of modern and vintage projects, including handcrafted jewelry. In each area of this site, you can click on the images or links to go to the page described. To get the free patterns, all you need to do is PRINT the pages you need. Printing instructions are listed near the bottom of this page. Start by reading all the pages in Macrame Essentials. From choosing cord material, to selecting the right beads, the subjects covered are very important to learn if you want to be successful in Macrame. For those who are new to this craft, or if you need a refresher, please visit the Macrame Dictionary. You will learn common terms used in this craft as well as those used in the instructions on this site. The next step is to visit Learn Macrame. There you will find a library of decorative knots, both basic and unique. Practice all the basic and vintage knots on the page. The Free Macrame Patterns listed in other areas will be much easier to make if you practice first. Are you experienced in the art of Macrame and interested in learning some new techniques? Included in Learn Macrame are instructions for a variety of Celtic Knots, which are based on historical artwork. Chinese Macrame features the traditional knot designs used to make unique and beautiful complex knots. These symbolic knots were created long ago and are interesting projects on their own. They can be used to create jewelry, belts, package decorations, wall hangings and more. Once you are finished practicing the basic knots, and are comfortable with them, it's time to create something! The Free Macrame Patterns can be found in the 4 sections described below. Each pattern listed on the following pages is free to print. There is a list of supplies as well as links to the knots used in the design. Micro-Macrame contains projects using fine materials, such as Satin, Leather, and Hemp. Listed in this section are a variety of free patterns for bracelets, necklaces, pendants, and earrings. Macrame Patterns contains projects that you can use for home decorating and organizing. There are plant hangers and tables, fashion items, and holiday decorations as well. In Macrame for Kids you'll find small projects that can be made by children ages 6 and older. Advanced Macrame are elaborate and challenging designs for those with plenty of experience. Don't try these if you are a beginner. Important: You must have a PDF creator installed on your computer, or this process will not work. I recommend the free program called PDF Architect. Right Click and find PRINT. Click PRINT, which will take you to a new window. Look for DESTINATION, which has the printer's name. Change it to the PDF creator's name if necessary. In most cases it's better to PRINT rather than SAVE. Click PRINT, and the page will print to your PDF creator. You should save it to a file on your computer, then print it again, this time to your printer. Alternate Printing Method: For computers that do not have these features, follow the first three steps (above), then click OK to print the Free Macrame Patterns to your printer. This site is regularly updated and improved, so some patterns may be taken off the lists and archived. Contact me if you need one. The green banner on the left upper area of each page will bring you to my Etsy Shop, AcajouCrafts. 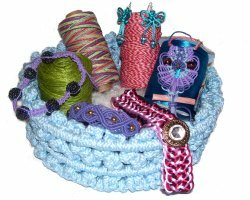 Both Macrame and Jewelry supplies are available, as are some of the actual handcrafted items seen in this site. The other ads are in the process of being removed, so bookmark them now if you want to go back to those pages.